With graphic language and scenes of violence, John Manos introduces his readers to some very unsavory characters in the novel Dialogues of a Crime. Subsequently, the author skillfully develops some extremely complicated temperaments and patterns of behavior in these characters. Young and naïve Michael Pollitz is probably the most complex of these. Beginning with Pollitz’s arrest in 1972 on drug charges, and continuing through a violent attack in prison and his subsequent release, John Manos amplifies the difficulties the man faces and how he is simply unable to fully recover. The fact that he is on very close terms with the leading family in the Chicago-based mob only adds to the complexities of Pollitz’s life. Moving forward to 1994, the reader is introduced to Chicago cop Larry Klinger. Klinger stumbles upon a link between the mob and Pollitz that promises to open up the opportunity of solving an old murder case. With the help of the state attorney Dan Whittaker, Larry begins to peel back layers of guilt, confusion and ambition as he tries to understand Pollitz and the other central characters. One surprising twist after another leads Klinger deeper into the complex relationships of the personalities. And he is even forced to take a fresh look at his own life. 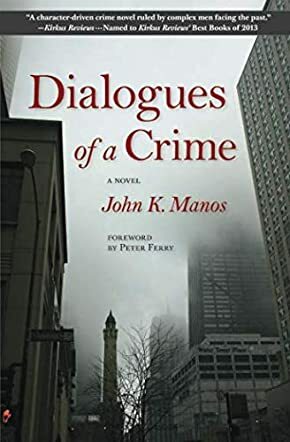 In Dialogues of a Crime, John Manos causes the reader to weigh the sometimes conflicting balance of guilt and the need to move on in life with loyalty and honesty, and of truth and convenience. It is not always pleasant, but it is always challenging. Manos introduces enough side characters and situations to keep the reader guessing as the story develops. The build-up towards the end of the novel opens old wounds for the central characters and the reader will most likely not anticipate the conclusion. It is all written in a skilled manner and the reader who likes novels of this genre will love this one!